Will Developing Nations Hack the Climate? How likely is it that geoengineering will actually be used on a global scale? Perhaps it’s more likely that hype around its effectiveness (eg “Negative Emissions”, CCS and BioCCS) will just be used as a tactic to delay serious emissions cuts, plunging us further into climate chaos. Or maybe (as the article below discusses), as 3, 4, 5 or even 6 degrees of warming wreaks havoc with the Earth’s bioshpere, individual states – or unaccountable corporations – will take matters into their own hands. The focus on a country like Bangladesh is an interesting one but let’s not be under any illusions that the greater threat of rogue geoengineering comes from the biggest polluters, and those with the greatest economic power – not those with the least. The biggest economies, such as the USA, and the biggest companies, such as Shell, have already decided unilaterally that the climate will be trashed for their own economic benefit. Why would it be any less likely that they’d unilaterally decide to geoengineer the planet, if they thought that was also in their economic interests? What if the poor and developing nations most vulnerable to climate change took matters into their own hands with geoengineering? One of the inherent injustices of climate change is that its greatest impacts tend to fall on nations that had little role in creating the problem, and few resources available to deal with it. Bangladesh, for example, produced less than half a metric ton of carbon dioxide emissions per capita in 2011, according to data from the World Bank. The global average was 4.9 metric tons. The United States generated 17 metric tons. And yet, as a low-lying nation with a large population, Bangladesh routinely faces a barrage of tropical storms, flooding, and drought that it doesn’t have the economic resources to deal with. 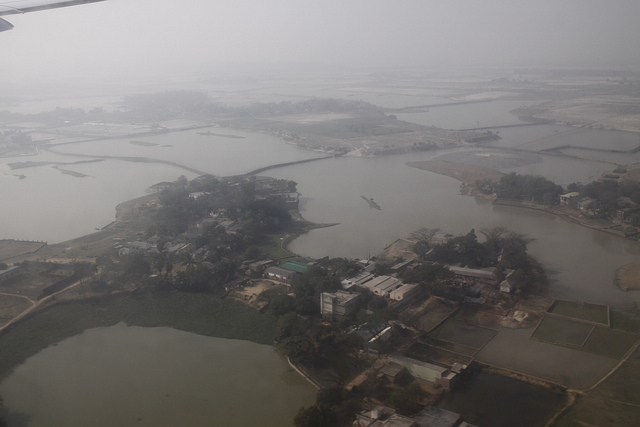 According to the United Nations, between 1980 and 2008, Bangladesh experienced 219 natural disasters, which resulted in $16 billion of damage. More recently, the financial analytics and global credit rating firm Standard & Poors identified Bangladesh — along with other impoverished or developing nations like Cambodia, Vietnam, Mozambique and Senegal — as being among the nations most vulnerable to extreme weather and other climatic shifts. Following the Paris climate conference last December, 177 countries have signed an agreement to keep global average temperatures from rising more than two degrees Celsius above pre-industrial levels. The agreement is meant as a starting point, with countries providing updated plans every five years. But if the plans laid out aren’t enough, vulnerable nations may have little choice but to consider more drastic measures. In some cases, that might mean mass relocations. In a more worrying scenario, it might mean taking global climate matters into their own hands. The concept of hacking the climate has been around since the 19th century, and efforts have been carried out on various scales. But it’s really in the last decade that the idea of geoengineering has come into serious consideration as a possible strategy in the fight against climate change. From mimicking the cooling effects of volcanoes to dumping iron into the oceans to increase the density of carbon-absorbing phytoplankton, geoengineering could take a variety of forms — and some of them might be well within the reach of a nation, or group of nations, made desperate by rising seas, ravaging storms, and lack of global cooperation on the issue. Caldeira says an international consensus on large-scale geoengineering projects would seem unlikely, but that might not stop severely distressed nations from acting alone. According to David Keith, a professor in physics and public policy at Harvard University, it would only take 25,000 tons of sulfuric acid, injected into the stratosphere by jumbo jets, to slash the current level of global warming in half after just one year. The sulfur would react with water vapor and disperse across the globe, reflecting a small but immediately effective percentage of the sun’s energy back into space. Of course, that regimen would have to be maintained and increased over time, to compensate for ongoing carbon pollution, so that by 2040, stratospheric seeding with sulfuric acid would require about 250,000 metric tons of the stuff and nearly a dozen or so jumbo jets. The cost at that point: about $700 million annually, Keith told the MIT Technology Review in 2013. That might seem expensive, but it’s just a tiny fraction of Bangladesh’s current GDP of $195 billion. In that sense, a little freelance geoengineering might seem like an attractive option for a country seeking to protect its citizens — particularly when current estimates suggest that rising seas could displace as many as 18 million Bangladeshi residents by 2050. As it currently stands, much of the international discussion of geoengineering takes place among rich, developed countries, rather than those nations that stand to benefit the most — should such extreme tactics prove viable. At the Climate Engineering Conference in Berlin in 2014, Parker said a large effort was made to include people from developing countries, but that a lot more work needs to be done. He directs a project called the Solar Radiation Management Governance Initiative, which has held meetings about solar engineering in countries like Pakistan, Senegal, and Ethiopia. Of course, large-scale geoengineering remains mostly a matter of conjecture, and its proper role — if one even exists — in addressing global climate change remains a matter of stark disagreement among the world’s experts. Some small-scale experiments have been carried out, but to date, no nation has a plan in place to implement a large-scale project. A 2015 National Academy of Sciences report recommended that research continues to determine the viability of geoengineering technologies, but it also noted that it should not be considered a substitute for reducing greenhouse gas emissions. Indeed, focusing on carbon dioxide reductions is one way to ensure that vulnerable nations won’t be forced to seek untested, 11th-hour solutions on their own, suggested Pablo Suarez, Associate Director for Research and Innovation at the Red Cross/Red Crescent Climate Center. Kristan Uhlenbrock is a freelance writer and a program specialist at the U.S. Climate Variability and Predictability Program in Washington, D.C. Artificial leaf turns carbon dioxide back into carbon dioxide – and this is somehow helping to fight climate change?